It's a Coupon Book on a card! 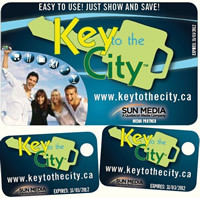 Unlock your City with the "key? to great savings! Save $ at hundreds of participating merchants with one little card! Many merchants offer 10% (some up to 20%) discounts - THAT CAN BE USED OVER AND OVER AGAIN (card expires March 31, 2013). 2012-2013 Key is only $20 - AVAILABLE NOW! With a card and 2 keychain fobs, one purchase can be used by 3 persons!! Children at Risk is currently has keys for sale - with a 50% return to the charity! The Key is so compact, we can even mail it out to you!